Responsibly exercising our legal right to wild camping on Holy Island, Arran. 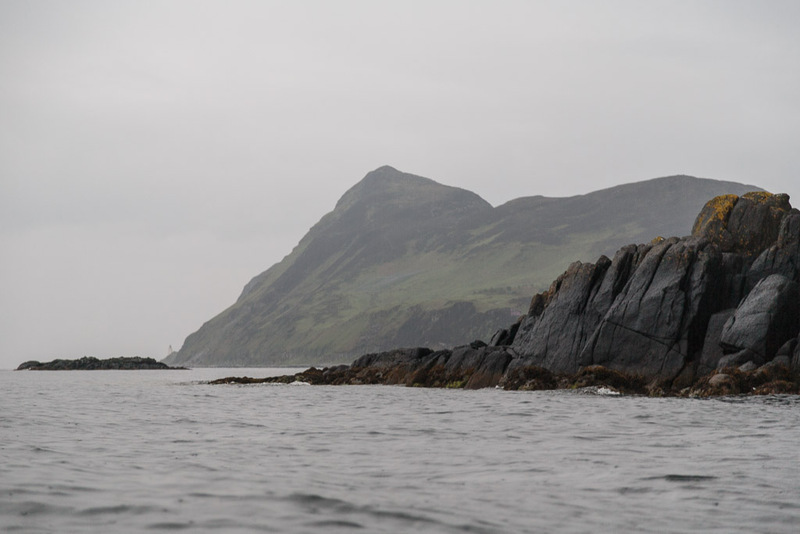 ...Clauchlands Point on the Arran mainland. 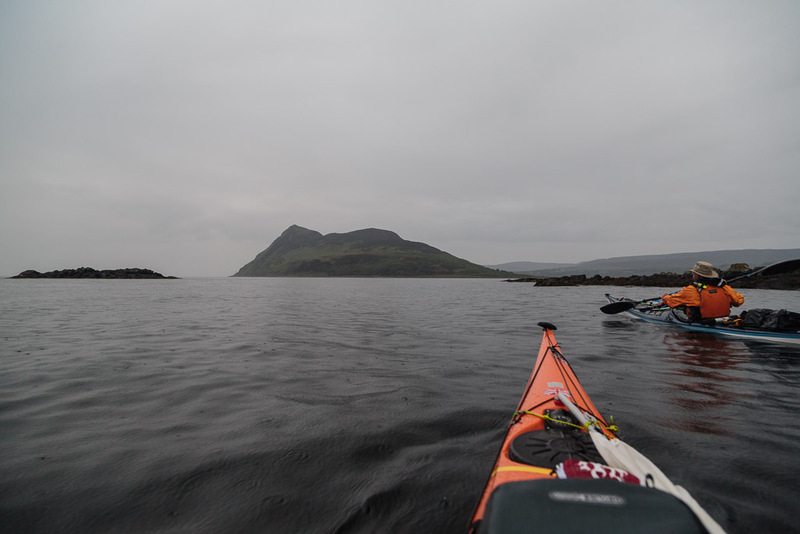 Holy Island lay across Lamlash Bay and as it was getting late we decided to wild camp on the island. we were not the only ones heading south. 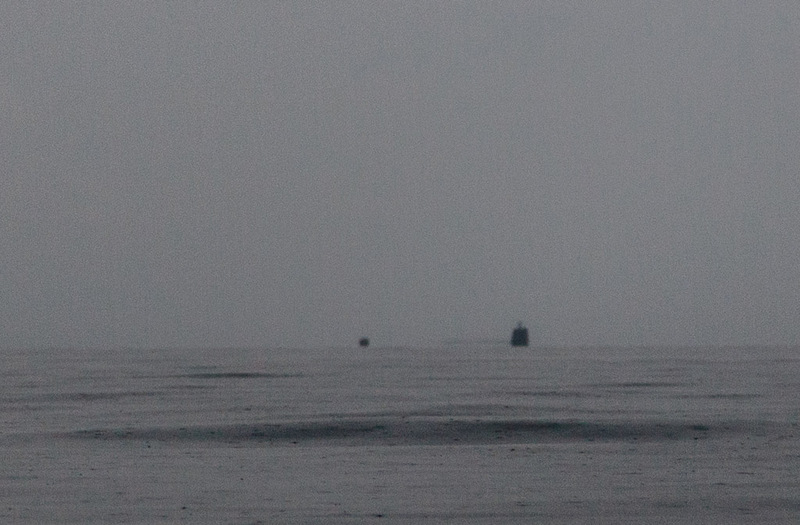 This submarine appeared out of the mist and rain. We decided to avoid the area on the east of Holy island because of the Buddhist prayer poles and the NW of the island due to the residential buildings for the volunteers. We also avoided the best bit of shingle because of nesting gulls, oyster catchers and ringed plovers. 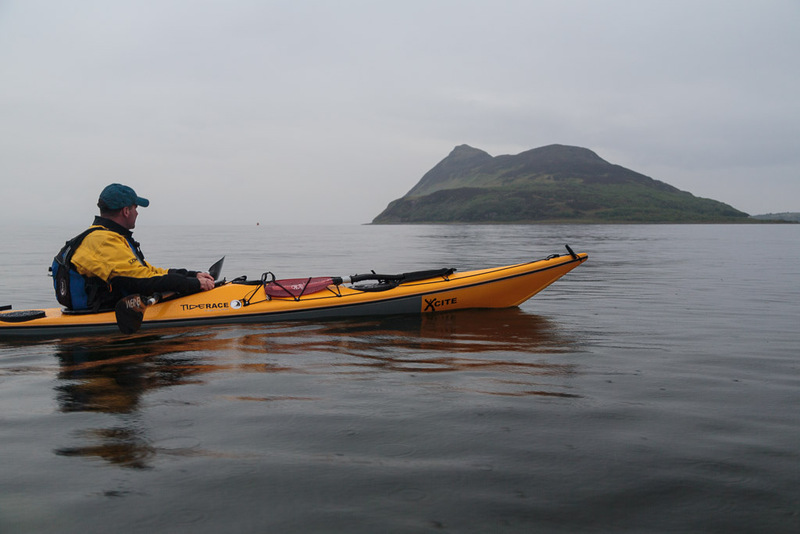 Despite a previous history of kayakers being asked to leave and the monks warning on their website "We strongly discourage camping anywhere on the island" and "no fires are lit", we were happy to exercise our legal right of discrete wild camping. It was still pouring with rain a a cold northerl;y breeze got up. We decided to warm ourselves by a small fire. We respected the monks request and lit our fire below high water mark (as we always do anyway). The driftwood on the shore was all soaking wet but I had brought my patent fire lighter...a bag of barbecue charcoal. Despite Mike's misgivings we soon had a small fire going. 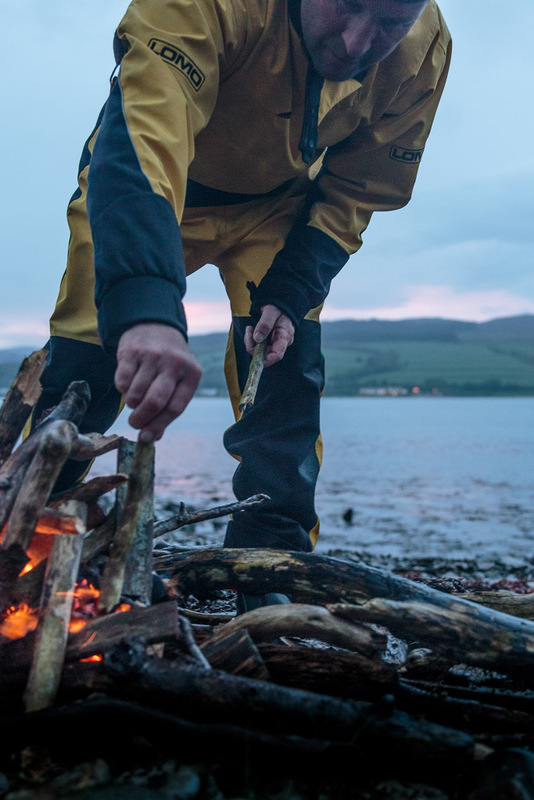 As it was very wet, we stayed in our dry suits to cook our meal. We enjoyed our meal by the fire and just for a second or two, there was a hint of a sunset. Ian pointed out a woodcock which flew backwards and forwards patrolling its territory round the edge of the wonderful new mixed woodland which has been planted by the volunteers. The following morning we were up at 6am and I took a stroll along the beach and was pleased to see that the previous no landing and no camping signs had been removed. We broke camp and left no trace. There was no sign of the ashes of the fire which had been washed away by the tide. Just as we were about to leave at 0730 we were approached by a very pleasant and polite female volunteer. She made no comment about camping not being allowed and was interested to hear where we had come from and where we were going. We chatted for some time about the west coast in general before she headed back along the path towards the Buddhist centre. Before she went, I noticed that while she was chatting with us, she had a good look at where we had camped and the area of woodland behind. We were pleased that nothing untoward had been noted before saying goodbye. 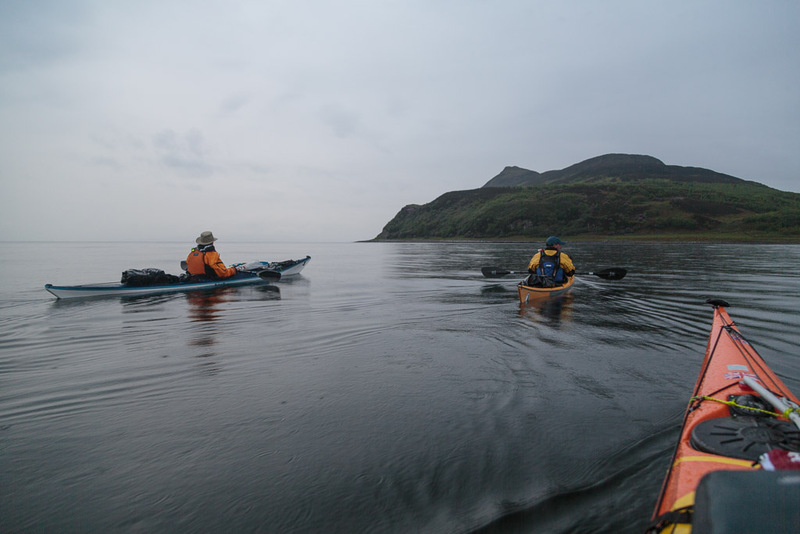 When we got home we discovered that another two kayakers had camped on exactly the same spot as us three nights later. 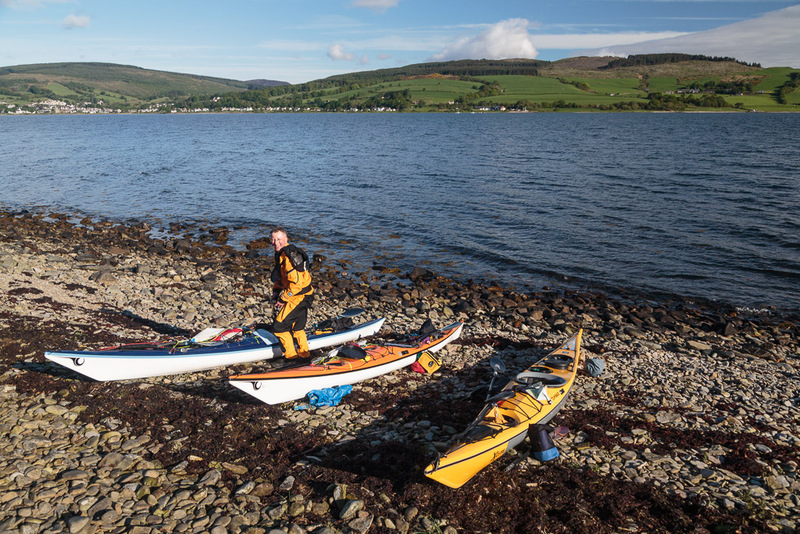 They thought the beach was too rough to land on so they paddled round to the Buddhist Centre and used their slipway before starting to trolley the kayaks round to where we had camped. Being right under the eye of the Centre, a volunteer came down and "strongly advised them not to camp" though he did acknowledge that he could "not prevent you". I rather thought that this was like waving a red rag at a bull and given the past history of camping problems on Holy Island I certainly would not have chosen to arrive so blatantly. Indeed the owner of nearby Sanda recently tried to stop people landing but was only able to prevent them using the pier and slipway, which were his property. The Land Reform Act allows people to access the land from a beach but not from private property such as a slipway or a pontoon. In this case, the monks could have very reasonably refused access to the kayakers and sent them back to the water. My advice is that it is legal to wild camp on Holy Island but do so sensibly and discretely. Arrive late and leave early to minimise disturbance, don't stay for a whole day or more. Be a small party, large parties by their nature are not discrete. Leave no trace. Don't camp by the prayer poles or near shore nesting birds near the NW point. Access rights extend to wild camping. This type of camping is lightweight, done in small numbers and only for two or three nights in any one place. You can camp in this way wherever access rights apply but help to avoid causing problems for local people and land managers by not camping in enclosed fields of crops or farm animals and by keeping well away from buildings, roads or historic structures. Take extra care to avoid disturbing deer stalking or grouse shooting. If you wish to camp close to a house or building, seek the owner’s permission. 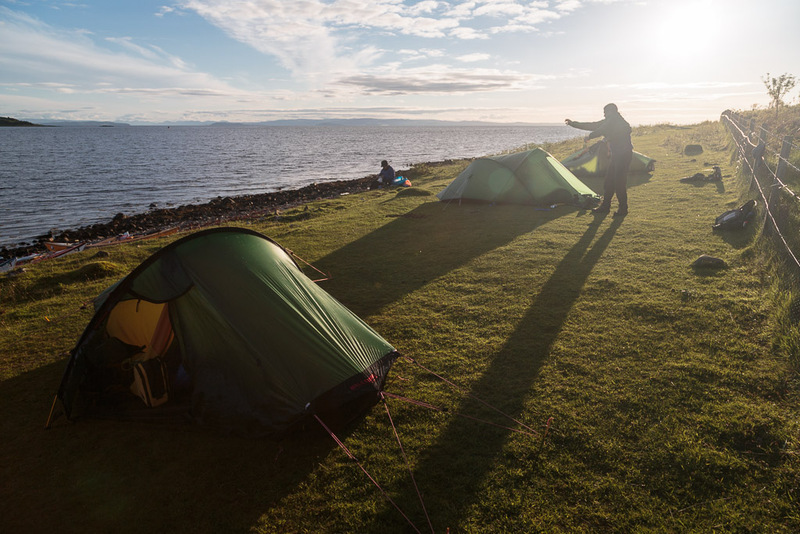 Leave no trace by: taking away all your litter; removing all traces of your tent pitch and of any open fire (follow the guidance for lighting fires) not causing any pollution. 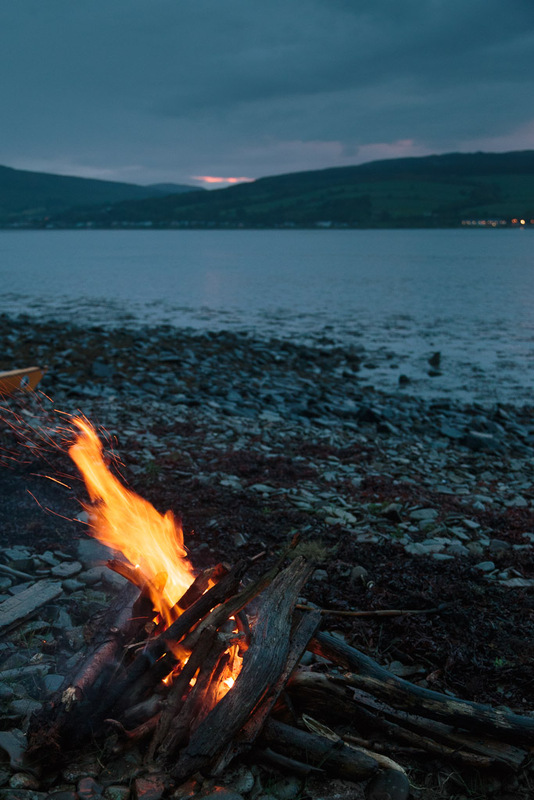 With respect to lighting a small fire on the foreshore, here is an extract from the Scottish Outdoor Access Code: "Public rights on the foreshore will continue to exist, including shooting, wildfowl, fishing for sea fish, lighting fires, beachcombing, swimming, playing and picnicking." I have previously posted on this subject:, it is worth reading some of the comments. An excessive attachment to the land. The Outer Light of Holy Island...Scotland's forbidden Island. Scottish access problem, is Holy Island closed? 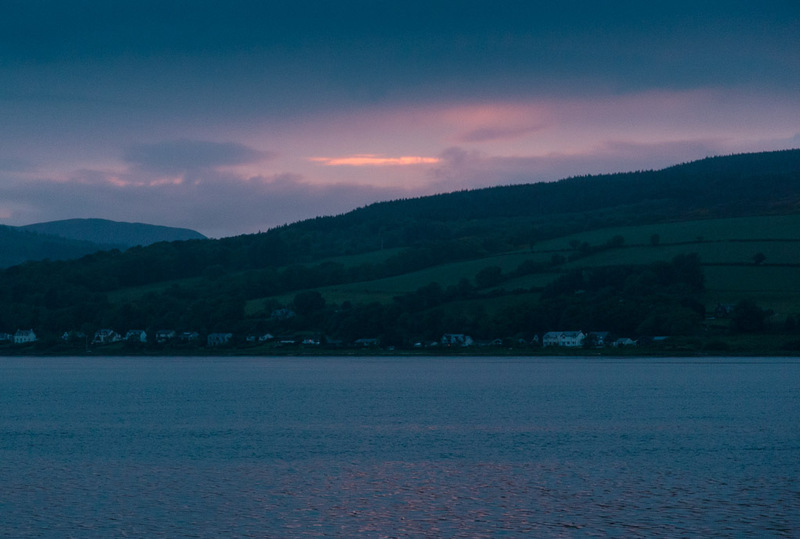 Holy Island of two faiths, Arran. Do Holy Island Monks think they are above the Law of Scotland? Holy Island, the cave of St Molaise and modern day monks.